Sometimes a color palette comes along that just totally makes me go weak in the knees. And this, my friends, is definitely one of those sort of palettes. 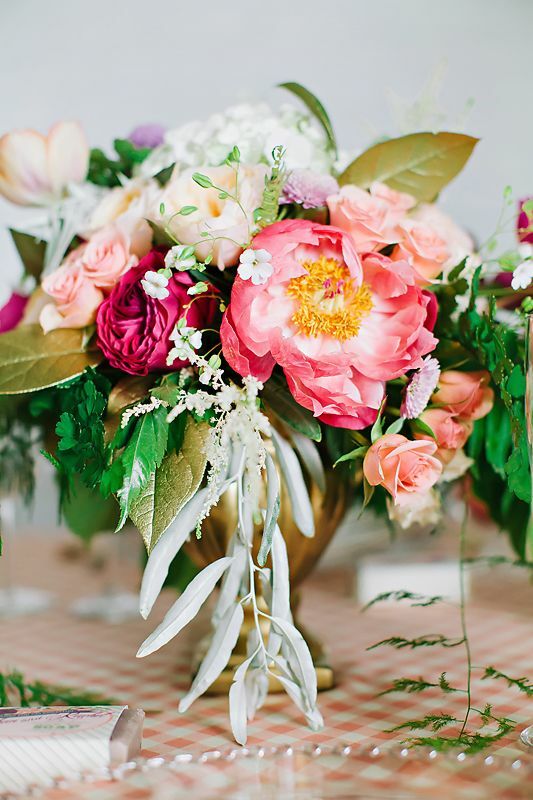 With styling and design by Design Loves Detail and big, beautiful blooms by Branches Event Floral, just one look and I'm feeling instantly inspired. 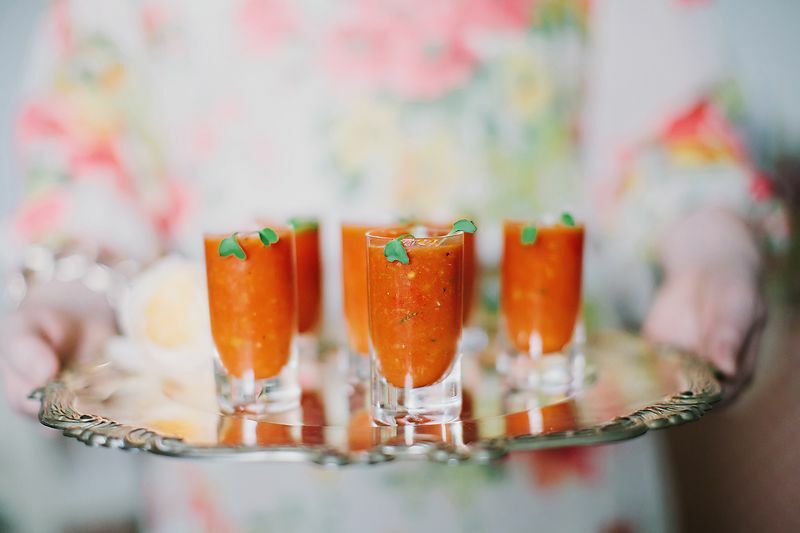 And lucky for us, Jaclyn Davis Photography was there to capture every colorful detail! "When asked to by a local publication to design a unique tablescape highlighting the important details of design, they knew they had to come up with design that stood out," says Amanda at Branches Event Floral. "We love using unexpected colors palettes and mixing unlikely pairs, so the choice of colors came to us pretty naturally. 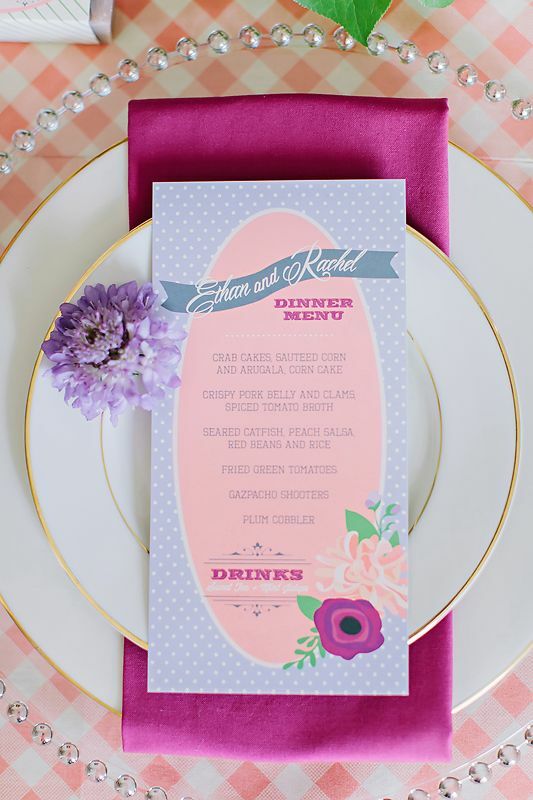 We love the charm of the South so with that we went with a theme of Southern Soiree. Georgia peach, Radiant Orchid and accents of Gold set the tone for this Georgia delight." Did you see how pretty this peach palette looks with these radiant orchid details? Such a gorgeous color pairing and the perfect look for a sweet Spring or Summer affair if you ask me. And of course, since my hubby and I live here in Georgia, I can't help but swoon a little over those darling peach details. And the food? I can't help but fall in love with this Southern inspired menu which features fried green tomatoes, crab cakes, seared catfish with peach salsa, red beans and rice, and plum cobbler. And to drink? Yep, you guessed it! Sweet tea and mint juleps! Heirloom Catering, you totally have me wishing I could have been a guest at that dinner table! Oh, I can't go without mentioning these stunning centerpieces. Branches Event Floral: Your eye for color and composition really shows! 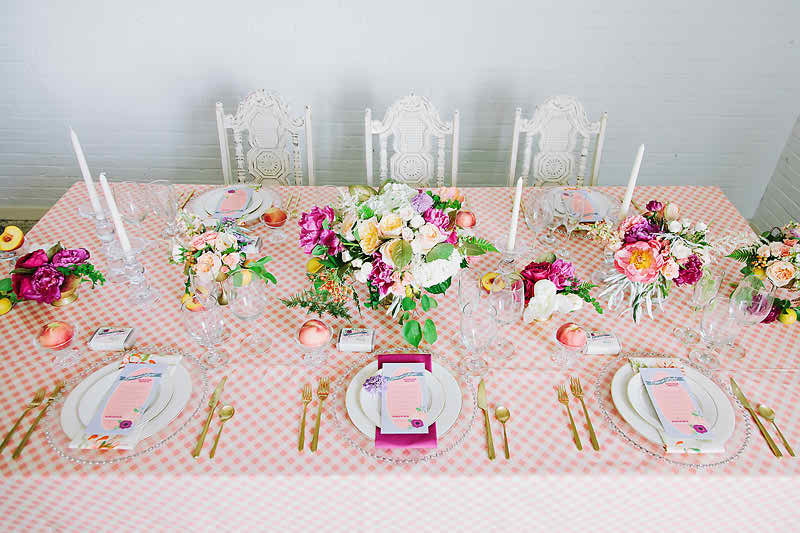 I'm obsessed with the way that these colors pop against the soft peach gingham tablecloth. And this mix of peonies, roses, and hydrangea really works! 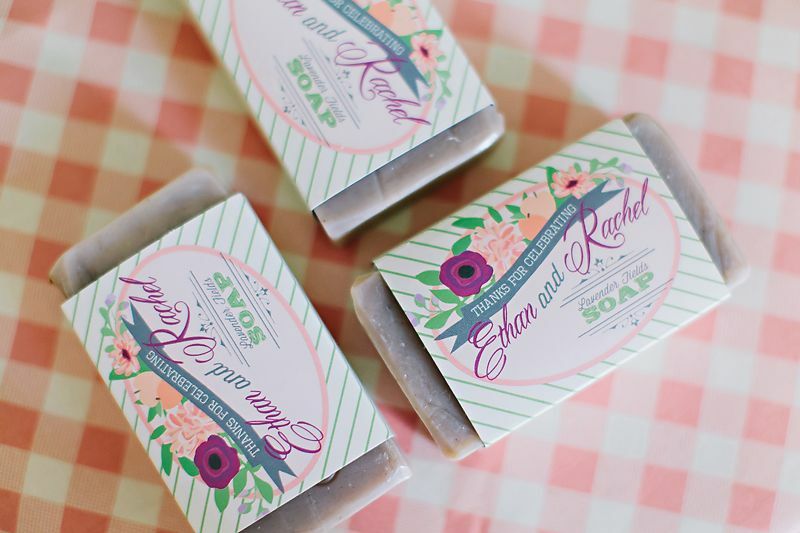 Perfect inspiration for your upcoming wedding, shower or party! Thanks to all the talented pros who made this styled shoot happen! Such a talented team of creatives. 9 Comments " Styled Shoot: Georgia Peach Meets Radiant Orchid "
This is darling! The gingham and polka dots make it so youthful and wholesome! What a unique and pretty palette! This is darling - that pattern makes it so adorable! This is speaking my southern roots! I love the use of peaches and the color palette is ridiculously adorable! I agree with the ladies, the pattern is what makes this entire shoot darling! Such a fabulous and unexpected color pairing! love, love, love the tabletop! and the blooms...absolute perfection! What a fresh and unexpected palette. I also love all of the bold patters and textures, especially that purple broccoli. It's always the little details that are so delightful. Obsessing over these colors. The florals are amazing!